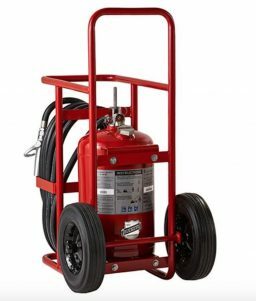 The 125 lb Wheeled Fire Extinguishers are built tough and durable and engineered for one-man operation for easy transfer through doorways, down isles, and over rough terrain. Great choice for offshore rigs, ship docks, chemical plants, aircraft ramps, refineries, remote construction sites, large laboratories, processing plants, storage, docking, and loading areas. 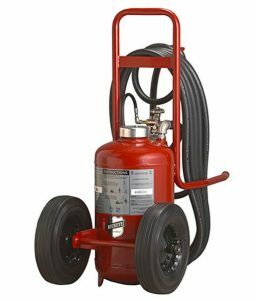 The 125 lb wheeled extinguishers have either ABC Dry Chemical or Purple K fire suppression agents that are either stored pressure, pressure transfer, or regulated pressure. We also offer Off Shore ABC and Purple K models where the steel cylinder and wheeled model frame are treated with a galvanizing compound undercoat, baked-on enamel top coat, and protective clear coat finish to prevent corrosion and fading from exposure to sun and sea. Tested and passes a 3000-hour salt spray test for added protection. 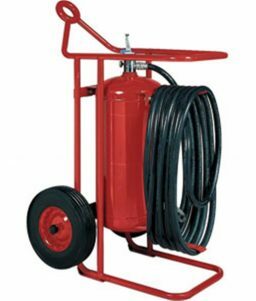 Hose lengths are 50-feet. 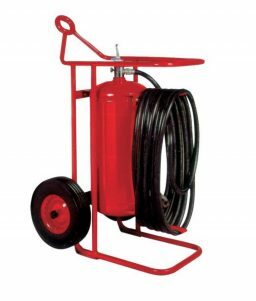 Depending on model they come with semi pneumatic rubber tires, steel wheels and steel wheels with rubber tread, and all are USCG approved and listed by the National Fire Protection Association, Underwriters Laboratories (U.S. and Canada), the Occupational Safety and Health Administration and the United States Coast Guard.